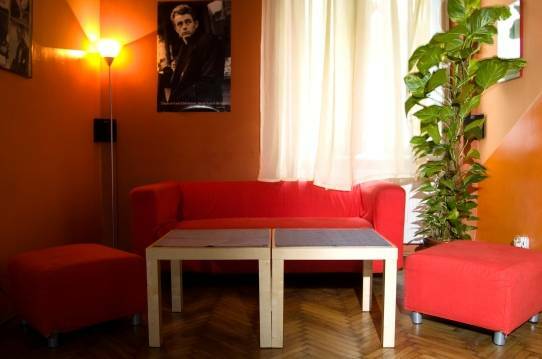 Situated near the Wawel Hill in Stradomska Street, our hostel is the milestone from which only five minutes walk to all the interesting tourist direction separate us. "Cinema Hostel" is the haven for travellers, oasis for the ones looking for companionship and adventure. 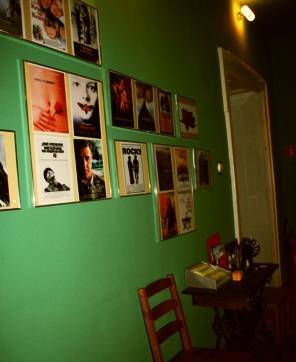 Situated near the Wawel Hill in the Stradomska Street, our hostel is the milestone from which only five minutes walk to every interesting, touristy direction separate us. After crossing Dietla Street the Cracow bohemia's home - Kazimierz - opens for us - tons of pubs, beer gardens, cafes. 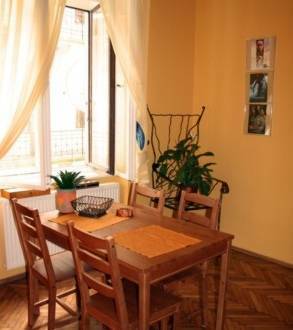 The unique (matchless) charm and magic of this district of Cracow place it in the first part of "tourist kit". Going in the opposite direction you will find an inimitable Wisla's bend with the Wawel Castle and Royal Route in the Grodzka Street, which leads us to the world's best main town square (the experts of the Public Spaces Project (PPS) have positioned Cracow's Main Market-square in the first place in the World's Best Marketplace Ranking). 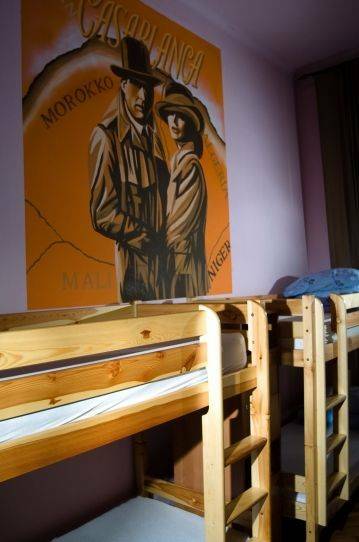 The hostel is a place in which we pay homage to Lumiere Brothers - the inventors of cinematograph. 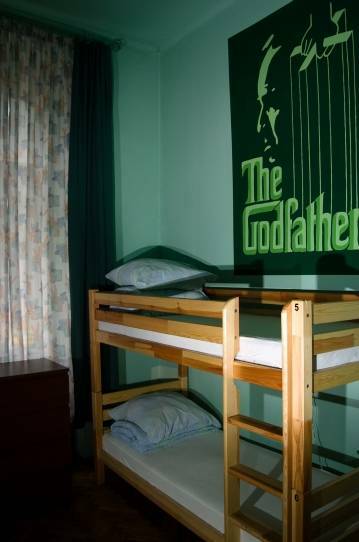 Theme rooms refer to our movie fascinations: Corleone, Casablanca, SinCity, Moulin Rouge, Matrix. If you wish to go through an adventure - do it with us. 1. Loggia in the Matrix room. 2. 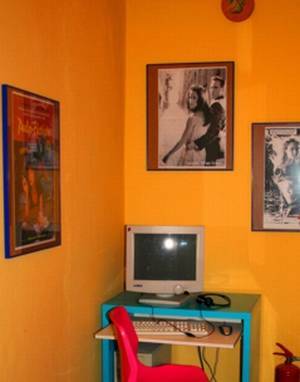 Computer with an internet connection at the corridor. 3. Wi-Fi all around the Hostel. 5. Reception desk 24 h.
6. Towels included in the price. 7. Soaps and paper towels in every bathroom. 8. Safe for valuables at the reception desk. 9. Seperate lockers for each guest in the rooms. 11. Free tea or coffe. 12. TV - 1000 channels. 13. Collection of DVD movies. 18. Beverages like Coke for sale. 19. Qualified and friendly staff. We offer brand new thick-mattressed bunk beds. After crossing Dietla Street the Cracow bohemia's home - Kazimierz - opens for us - tons of pubs, beer gardens, cafes. The unique (matchless) charm and magic of this district of Cracow place it in the first part of "tourist kit". Going in the opposite direction you will find an inimitable Wisla's bend with the Wawel Castle and Royal Route in Grodzka Street, which leads us to the world's best main town square. From Wawel Hill go along Stradomska st. towards Dietla st.- before you cross the Dietla st. you can see our hostel in the right side of Stradomska st.(at night) look for the green neon "CINEMA HOSTEL"
From The Wawel Hill go along Stradomska st. towards Dietla st. - before you cross the Dietla st. you can see our hostel in the right side of Stradomska st. look for the green neon "CINEMA HOSTEL"
Take tram #19 or #10 - get off at the tram stop 'Stradom'. The tram stop 'Stradom' is next to our hostel entrance (it takes about 3 5 minutes). You can also walk along Gertrudy Street and you will get to Stradomska Street turn left towards Dietla Street, the hostel will be on your right side before crossing the Dietla street ( it takes about 15-20 minutes). Take a special fast train to the Cracow Main Station then use the instructions above.